Above, Eugene Hale Brading montage. Below left, Map of Dealey Plaza with a view of the Dal-Tex Building, below right, views of and from the Dal-Tex Bldg. from an article published in the Saturday Evening Post. ‘Braden, along with ex-convict Morgan Brown, was staying at the Cabana Motel, the same motel visited by (Jack)Ruby the night of November 21.’ – Jim Marrs, Crossfire, 1993. ‘While visiting the alleged assassin’s grave on the third anniversary of his death he(author William Morris) encountered an agent who’d worked with Oswald in the CIA…Agent X told him that (Loran)Hall was in Dallas on November 22, 1963 as part of the assassination squad which was directed by Eugene Hale Brading.’ – Alan J. Weberman & Michael Canfield, Coup d’Etat in America, 1975. ‘While we were in the criminal courts building we saw Eugene Brading, aka Jim Braden…Braden would later leave Dallas by way of Love Field Airport.’ – Chauncey Holt & Wim Daakbaar, Self-Portrait of a Scoundrel, 2013. ‘Carlos Marcello would utilize Guy Bannister and David Ferrie for (Castro opponent Mario)Kohly’s exile groups at Lake Ponchatrain, Louisiana. Eladio del Valle was the coordinator and liaison between the two groups.’ – Robert D. Morrow, First Hand Knowledge, 1992. ‘I received a second phone call. It was del Valle…he asked me to supply him with four transceivers which were not detectable by any communications equipment then available on the market.’ – Robert D. Morrow, First Hand Knowledge, 1992. ‘Hall later told DA Jim Garrison he was offered $50,000 to kill JFK but turned it down.’ – Charles E. Hurlburt, It’s Time for the Truth, 2012. ‘They had better be perfect, compadre. They are for Texas…Kennedy’s going to get it in Dallas.’ – Robert D. Morrow, First Hand Knowledge, 1992. 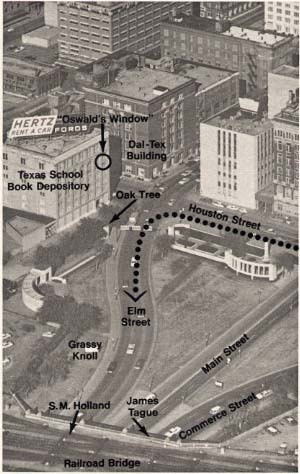 The Dal-Tex Building was located across the street from the Texas School Book Depository. It offered a great view of JFK’s motorcade from behind, which was not obstructed by trees like portions of the view from the alleged ‘sniper’s nest’ on the 6th Floor of the Book Depository. In the moments after the JFK assassination a man named Eugene Hale Brading(aka Jim Braden) was arrested for questioning after he was discovered on the 3rd floor of the Dal-Tex Building. He was a complete stranger to the area and said he was in the building looking for a phone to use. Brading was known as a Mafia courier for the likes of gangsters such as Santo Trafficante, Carlos Marcello and Meyer Lansky. Braden was not known as an expert marksman or assassin like some of the other JFK assassination suspects. He may have served as a radio coordinator for the JFK shooters, whose role would be to give the word for the assassins to fire in simultaneous volleys to conceal the true number of shooters and gunshots that day. Braden was also in the vicinity of the RFK assassination later on as well in California in 1968. An electronics expert named Robert D. Morrow wrote a book called First Hand Knowledge in which he claimed that a Cuban exile named Eladio del Valle asked him to make several sets of low band radios and earpieces which would only have to work for a few minutes which no 3rd parties could intercept or monitor. He assumed they might be used for anti-Castro plots only to learn later on that they may have been used instead to coordinate the JFK assassination. Braden presumably could have used said transceivers to communicate with the several teams of shooters to coordinate and minimize their shooting to fit with the pre-planned ‘Oswald did it’ scenario. Presumably the plot called for killing JFK with as few shots fired as possible to make the planned ‘lone nut’ scenario at least somewhat plausible. If the shooters in the Dal Tex Building, TSBD or the County Records Building in Dealey Plaza had done their jobs more efficiently, and actually killed JFK with their shots from behind, no extra shots would have been needed from the Grassy Knoll or anywhere else! As it were, one shot from the Dal Tex Building hit JFK from the back, while another missed altogether and hit a curb which in turn splintered and hit a witness named James Tague. JFK was hit numerous times in the throat and torso and was in bad shape but was still clinging to life before he was finally finished off by the fatal headshot from the right front. Retired US Steel engineer turned JFK assassination investigator, Tom Wilson, noticed the figure of a gunman with a goatee in the Dal-Tex Building using photonic imaging techniques. Facial hair was out of vogue in 1963 in the USA because of anti-Castro sentiment. One such JFK conspiracy suspect who wore a goatee, nevertheless, was a CIA affiliated mercenary named Loran Hall.